Self-driving vehicles could be the future of transport. Could they provide the ideal travel solution for blind people? Allan Russell, presenter at RNIB’s Insight Radio, spoke to Alan Nettleson, Senior Technologist at Transport Systems Catapult about the driverless pod at the Techshare Europe 2016 Conference.Techshare 2016 is Europe’s leading accessible technology conference recently took place in Glasgow. Alan, first of all please tell us a little bit about the pod. So this is a very small electric vehicle, which accommodates two people and their luggage. The idea is that it is a fully driverless vehicle that’s fully automated. We’re starting trials in pedestrian areas of Milton Keynes and we’re looking at an area between the railway station and the shopping centre. It’s aiming to provide a transport service for the mile journey between the two places. Can you give us an idea of what the car or pod looks like from the inside and out? It’s substantially smaller than the Smart car, and the reason is because we’re envisioning a future of low-speed, low-mass vehicles that save energy but also provide on-demand transport service that people need. So the pod’s really shrunk down and surrounded by clever sensors and kit that makes it able to sense its environment, locate where it is in the world and negotiate its path and where it’s trying to get to. When it’s out on the road then, is it mingling with other traffic or does the pod have its own dedicated lane? Well we’re starting the trials in pedestrian areas. We’re lucky that in Milton Keynes we have very wide pedestrian areas. Everything’s much slower and safer so we can start there. But we also have a lot of issues as pedestrians are quite unpredictable, we’ve got cyclists, dogs, children and parents with pushchairs so safety is our number one priority, that’s why we’re starting our trials at very low speeds. You mentioned the car is packed full of technology. What kind of things does it use to find its way around or interpret some of those obstacles? Well there’s two parts, firstly there’s the kit that enables it to sense its environment. We’ve something called lidar which is like radar but with light, and it does actually have radar too. It’s got cameras so it can visually interpret its environment and it’s got ultrasonics which is on a lot of cars now which lets you know if there’s an obstacle just behind you when you’re reversing. There’s a bump strip too so that really knows if it’s detected something. The very final level of protection is a human driver which we’re keeping in the vehicle as a final back up in case any of those systems go wrong. Is the intention for the vehicle to be a public assess vehicle or would people own the pod themselves? The vision is for the pod to be a public assess vehicle that reimages public transport. So one day, you might be able to use a Smartphone to call one of these or go up to the street and press a button on a particular pod spot to hail one of these pods and it’ll be able to come and pick you up, or it’ll just be there waiting for you to take you to your destination. The idea of driverless cars, although not a relatively new concept, is still something people are a bit uncertain of from a safety factor. How do you persuade the public that they are safe and they are the thing to carry on developing? I don’t think we should be persuading the public, I think we should be demonstrating that these vehicles are safe and that can only really be done through testing. To do this, we need to get out there, we need to be testing both in the virtual environment and in the real world. The more and more situations we come across that we can’t deal with, we need to work out how to deal with them. And until we do that, they won’t be available to the public. How long will the trials run for and what are you hoping will progress beyond that? 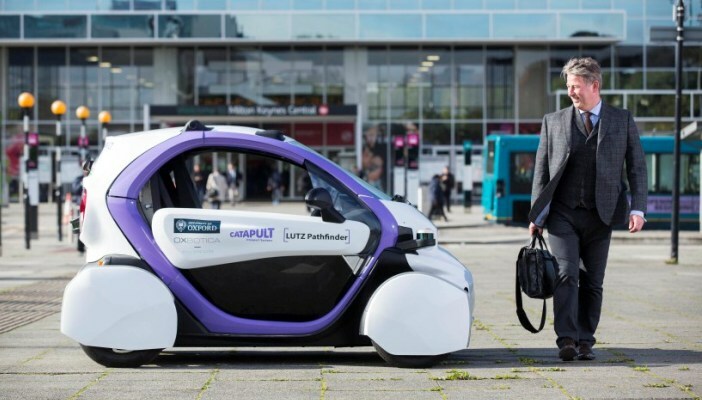 The trials will run well into next year but that’s leading onto the UK Autodrive programme which is a much larger project which is aiming to build 40 of these pods which will be running around the streets of Milton Keynes. Keep up to date with the latest developments at Transport Systems Catapult and the UK Autodrive programme. Listen to more interviews by RNIB Connect Radio from the Techshare 2016 event. Find out more about RNIB Connect Radio.